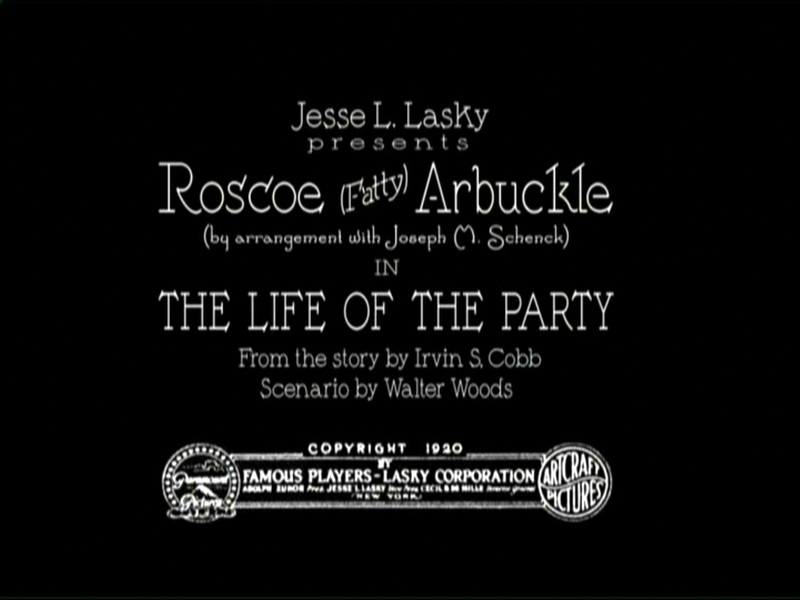 Early in Roscoe Arbuckle’s charming feature comedy The Life of the Party (1920), his character, instantly smitten by a female visitor to his high-rise law offices, stumbles backward through an open window, and hangs precipitously several stories in the air. 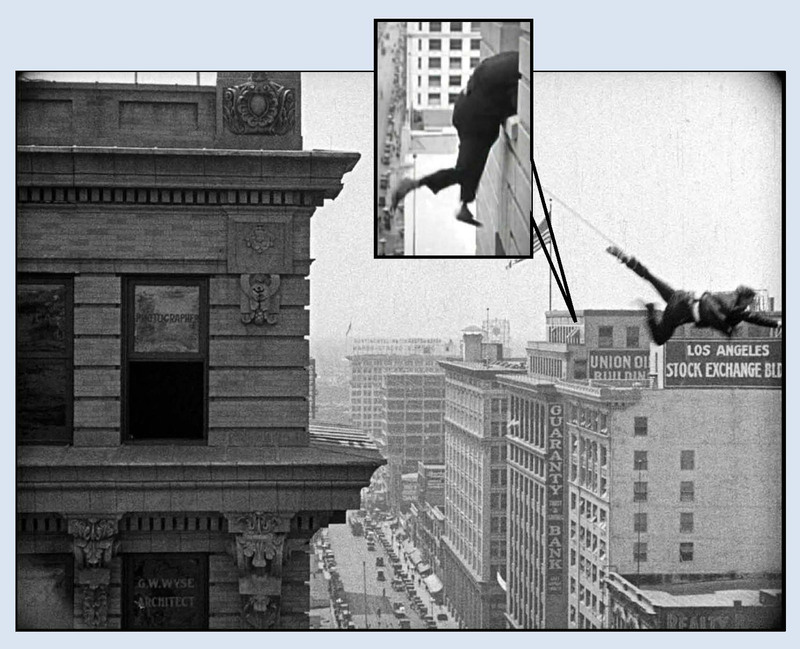 Though not integral to the plot, Roscoe’s brief scene presages Harold Lloyd’s later stunt climbing work in downtown Los Angeles, and has a direct connection with Lloyd’s masterpiece Safety Last! (1923). Click to enlarge – Roscoe in TLOTP and Harold in Safety Last! one block further up the street atop the Merchants National Bank Building, prominent in Roscoe’s frame (Lloyd’s approximate location is marked by the gray box). 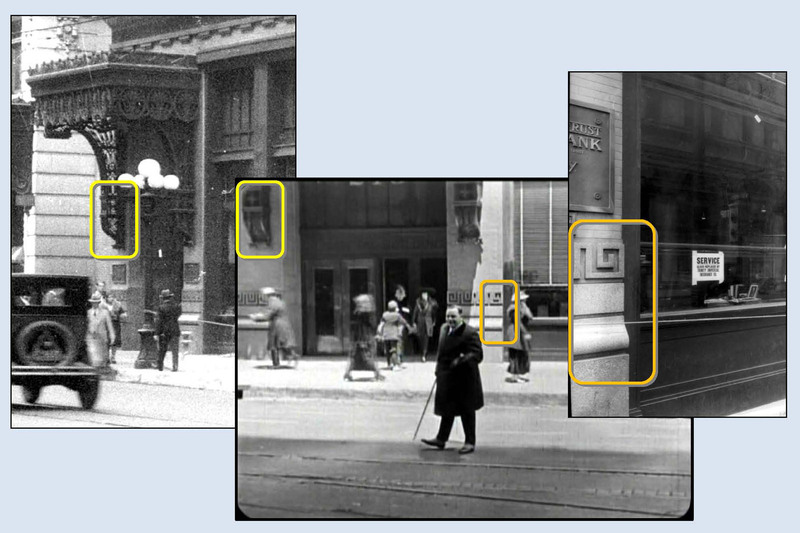 Both views show the side building signs for the Alexandria Hotel (yellow box) and the Security Trust and Savings Bank (red box). 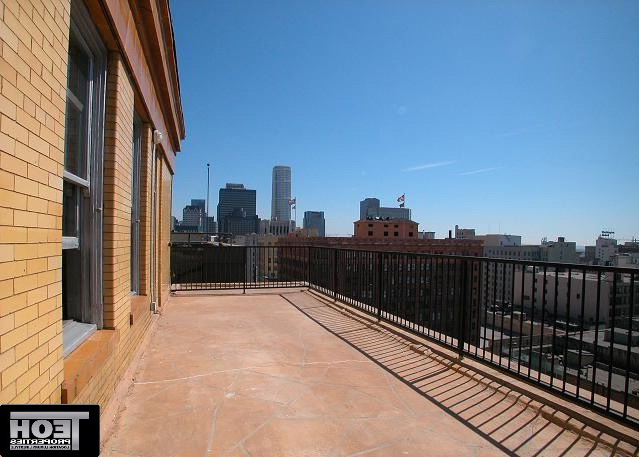 Roscoe filmed his stunt atop the stepped-back terraced roof of the extant Bartlett Building, built in 1911 at 215 W. 7th Street, in the heart of the Los Angeles historic core, converted now to condos and lofts. Behind Roscoe, visible up the street, stands the extant Merchants National Bank Building (now also condos and lofts) at 548 S. Spring Street. 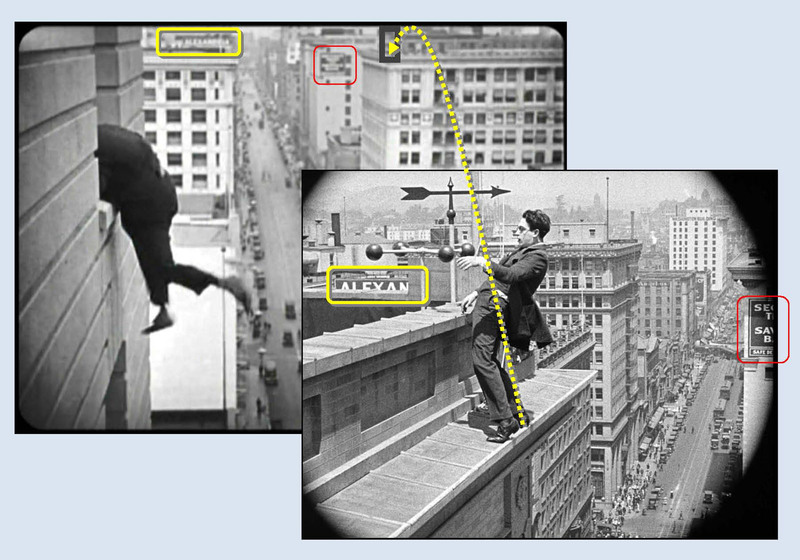 Harold Lloyd built a set atop the Merchants Bank to stage the final (and highest) segment of his climb up a skyscraper in Safety Last! Click to enlarge – looking west at Spring Street between 7th and 6th. The yellow arrows point up Spring from 6th, the red arrow points up Spring from 5th. 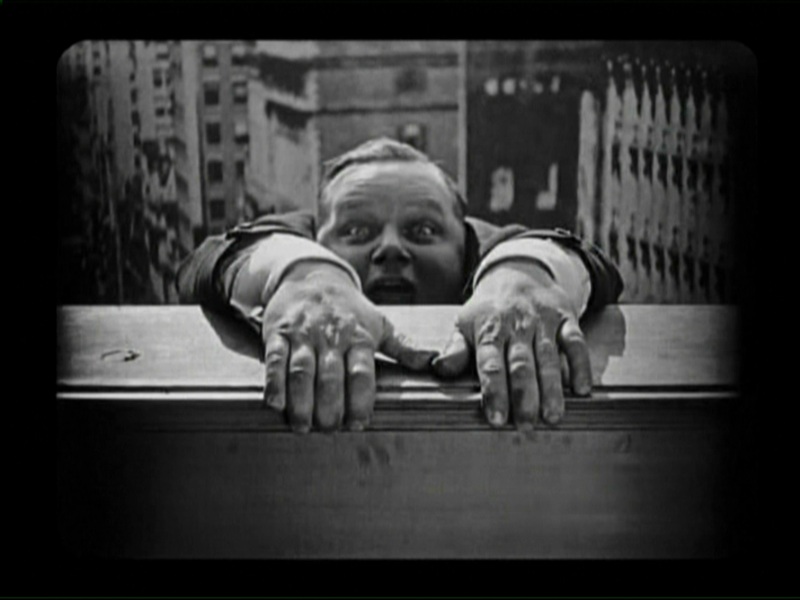 Lloyd filmed a total of five stunt climbing comedies: Look Out Below (1919), High and Dizzy (1919), Never Weaken (1921), Safety Last!, and Feet First (1930). The first three were filmed using sets overlooking the Hill Street Tunnel (see post HERE), while Never Weaken went further, staging scenes filmed atop the extant Ville de Paris Department Store building at the SE corner of 7th and Olive. 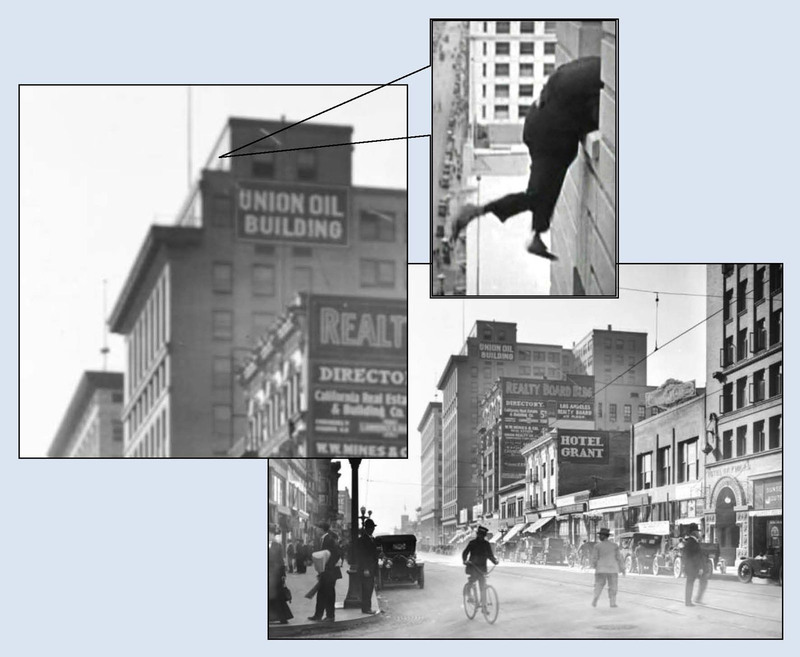 Thus, when Roscoe filmed TLOTP during April 15 – May 22 of 1920, he filmed in downtown, on a real building, more than a year before Harold did. You can read a list of the 15 real buildings (13 are still standing) that appear in Harold’s stunt films at this PDF link. Click to enlarge – this view from the finale to Safety Last! 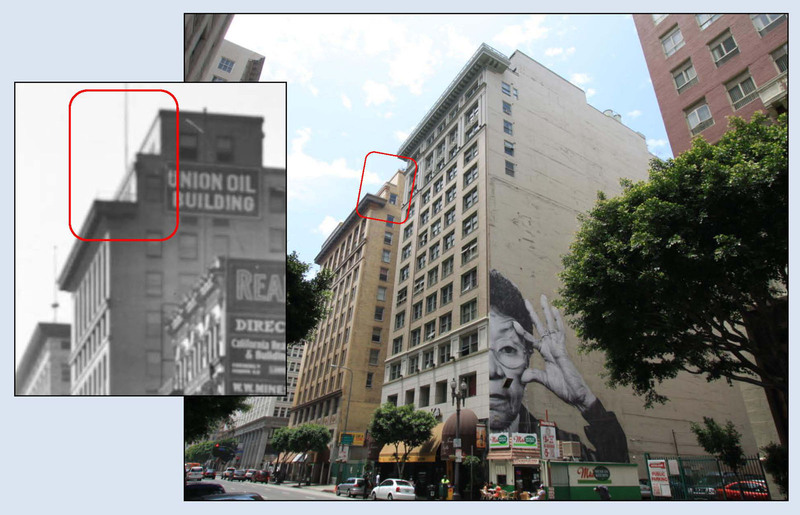 looks south down Spring from 6th towards the Bartlett Building (Union Oil) terrace where Roscoe filmed (inset – his frame is reversed to aid comparison). The tall Los Angeles Stock Exchange Building began construction in 1921, after TLOTP had finished shooting – hence, it does not appear in Roscoe’s shot. The establishing shot of Roscoe was filmed at the 7th Street entrance to the Bartlett Building, also known at the time as the Union Oil Building, its primary tenant. 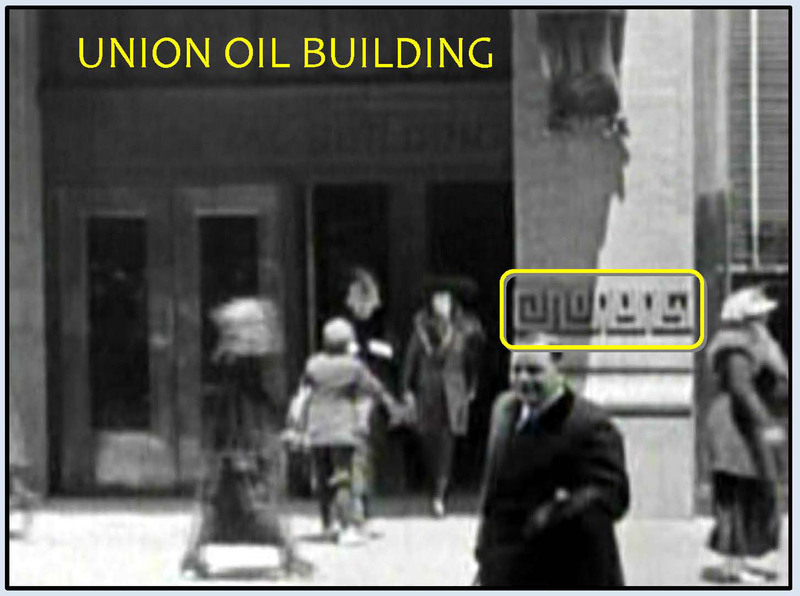 You can barely read “Union Oil Building” over the door, as well as the bottom edges of the numerals “215” (see below). 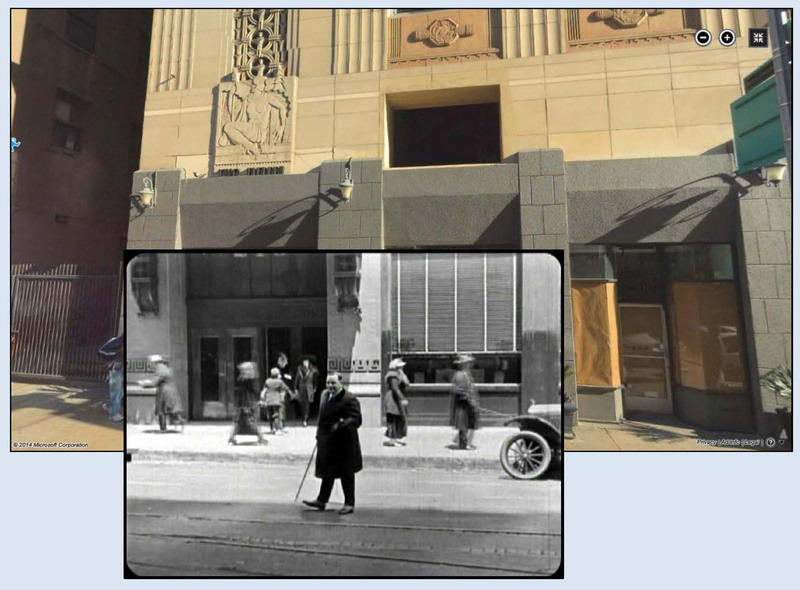 Click to enlarge – matching details of the Bartlett Building (Union Oil) entrance at 215 W. 7th Street compared to 1933 photos of what was then the entrance to the Security-First National Bank. USC Digital Library. 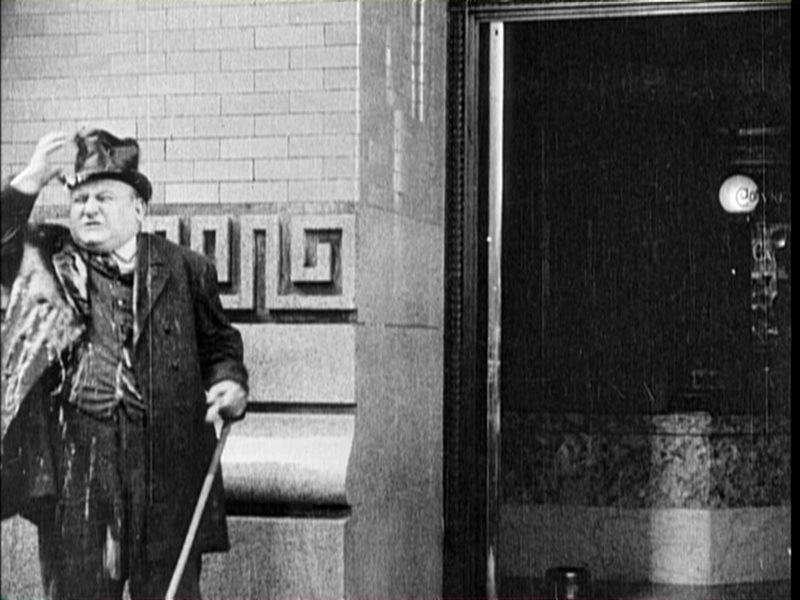 Jess Dandy is soaked with a bucket of water beside the same entrance to the Bartlett Building during this scene from Charlie Chaplin’s The New Janitor (1914). Looking south down Spring from 6th towards the Bartlett Building (Union Oil) rooftop filming site. 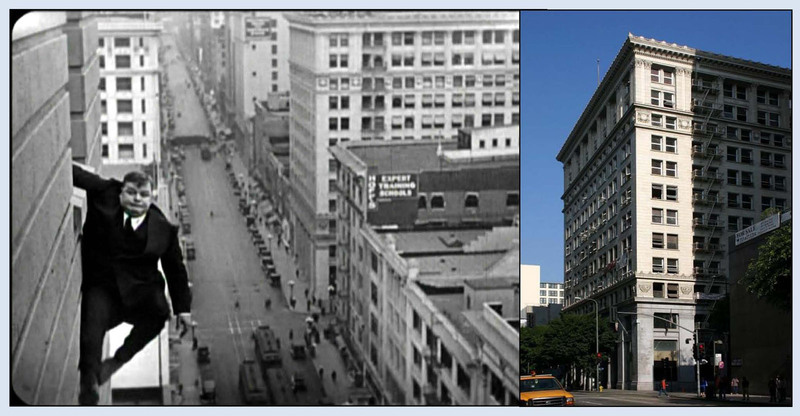 This view more closely matches the street at the time of filming, taken before the tall Los Angeles Stock Exchange Building was completed in 1921 to the right of the Bartlett. USC Digital Library. A modern view south down Spring towards the Bartlett Building filming site and the Stock Exchange Building next door to the right. Jeffrey Castel De Oro. This simple setup is all it takes to convincingly portray a person in peril at great height, without using CGI. 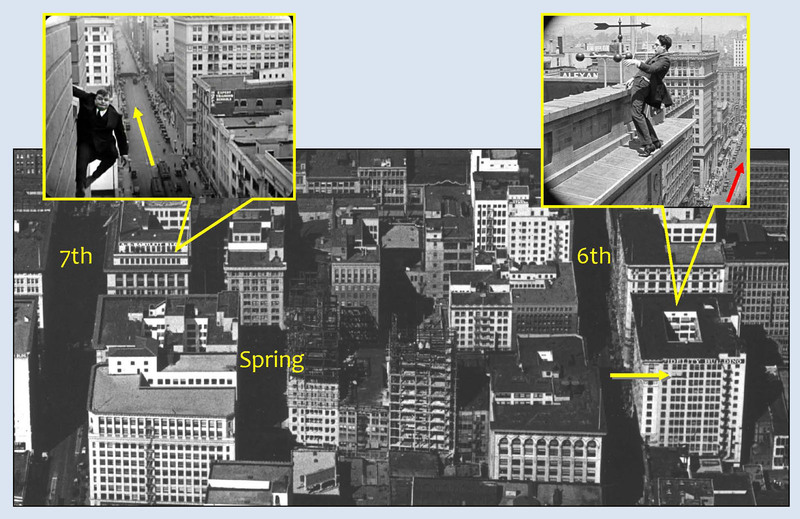 Roscoe’s stunt scene could be easily recreated today from the same rooftop. I often wonder why this simple and highly effective shooting technique, more convincing than CGI, is not used in modern films. so beautifully, and to TCM for broadcasting it for eager viewers to enjoy. I have many other posts about Safety Last! you can view here. HAROLD LLOYD images and the names of Mr. Lloyd’s films are all trademarks and/or service marks of Harold Lloyd Entertainment Inc. Images and movie frame images reproduced courtesy of The Harold Lloyd Trust and Harold Lloyd Entertainment Inc. The Bartlett Building today, at the NW corner of 7th and Spring. This entry was posted in Harold Lloyd, Los Angeles Historic Core, Roscoe Arbuckle, Safety Last! and tagged Bartlett Building, Charlie Chaplin, Harold Lloyd, Lloyd Thrill Pictures, Los Angeles Historic Core, Safety Last!, Silent Comedians, Silent Comedies, Silent Movie Locations, Silent Movies, The Life of the Party, The New Janitor, then and now. Bookmark the permalink.